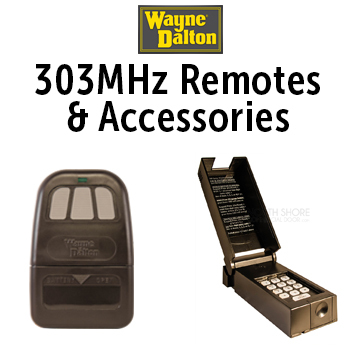 How do I know Which Wayne Dalton Remote to Order? Wayne Dalton remotes come in two frequencies. 303MHz and 372MHz. Check the information below to find the model # of your garage door opener to determine which frequency of remote you need. If the model on the back of the remote is something like 81WD or 61WD then Click Here to go the the LiftMaster Page to order remotes. We have the right Wayne Dalton garage door opener for your new or old door at Garage Door Supply Company. We're an authorized Wayne Dalton dealer, which means we have the expertise to help you chose a replacement garage door opener remote. Check your receiver, because Wayne Dalton frequencies are not compatible with each other. 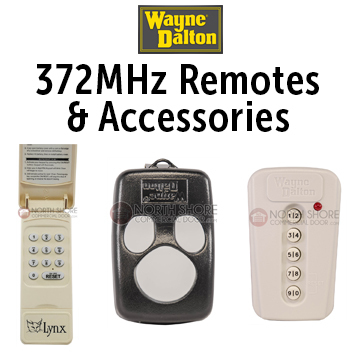 Wayne Dalton has been using the 372MHz frequency remotes since 2003. Your remotes come boxed with all the accessories you need. If you don't see a Wayne Dalton remote or the accessories that you want on this page, contact our staff. We'll help you find what you need at an affordable price. Either email us, or call 1-888-346-3173.